Be it entrepreneurs, organizations or accounting firms, PayTraq offers ERP solutions for everyone. It allows you to safely secure all your work on a cloud-based platform so that your team can work in collaboration. PayTraq also offers you to personalize and customize your sales orders, quotes, invoices and credit notes. Track your inventory with its powerful purchasing and supply chain tools. You can also make and receive payments in multiple currency through PayTraq. 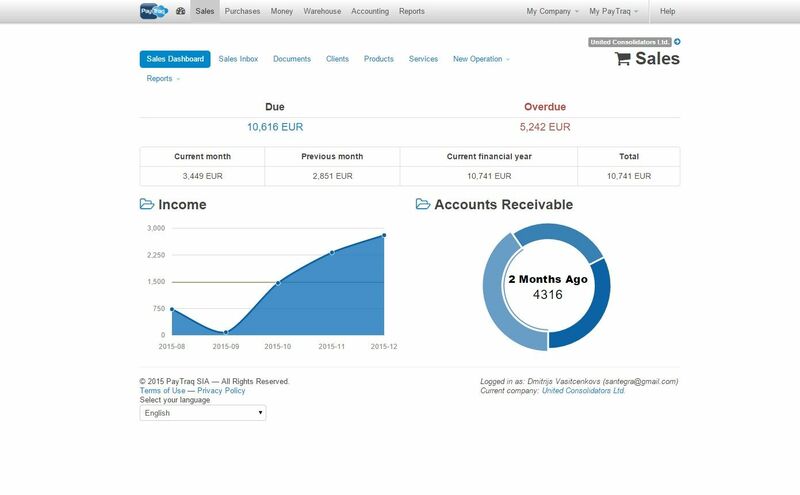 For accounting firms, PayTraq offers tools and features that integrate accountants and bookkeepers with their clients on a common platform. How much does PayTraq cost ? The pricing for PayTraq starts at $18.0 per month. PayTraq has 3 different plans such as - Standard at $18.0 per month, Business at $30.0 per month and Premium at $60.0 per month. Includes all the Features of PayTraq. Disclaimer: The pricing details were last updated on 13/04/2018 from the vendor website and may be different from actual. Please confirm with the vendor website before purchasing. Decent cloud accounting and warehouse management platform for small to medium sized businesses. Pros: It does the job it is supposed to do and saves time in our every day routine. We switched to this platform after using its predecessor for quite some time. Learning curve for basic functions is short and manageable within a few hours. Phone and email support is friendly and efficient, this is more important that it may seem initially. Even more so, we have suggested some minor features and actually got them implemented. PayTraq has API interface, which makes it friendly for automation. It is cloud based, has mobile app and PayPal integration. There are three pricing levels, which will suit different company sizes: 1-3 users, 10 users and 50 users. Basic level is cost effective and will save you money for other expenses. As the business grows, it can be promptly switched to next level. The platform is evolving, too, which adds more features and more functionality along the way. Cons: We miss additional features, like export/import of warehouse items, integration with eCommerce platforms like Opencart, Not everything is as intuitive as one could wish. Overall: I has made our life easier and accounting more manageable. We can even do it ourselves without the premium cost of a professional accountant. Comments: We are a small accounting company that loves numbers, technology and our customers. Our clients are also small businesses that operate in the different areas and entrust their accounting to us. And here we come to their aid armed with PayTraq. Thanks to the cloud technologies, we work together with customers sharing the efforts and goals from any location. Our clients don't need any complex installations, just the usual web browser. All this makes our partnership simple, convenient and affordable. With PayTraq our customers¿ business is always transparent and clear. You can easily track the beginning of any business transaction, and follow its course, understand the outcome and the impact on your business. With PayTraq you can keep all the figures in your business in their place. Comments: PayTraq has made accounting so simple for us. We started our business a few months ago and always have had problems with other accounting software. The time it took us to understand how to use this software is unbelievable, as others we don't even understand thoroughly until now. Due to not understanding the previous software we started researching for other tools and found PayTraq. We're so happy that we gave PayTraq a try and will continue to use this tool. It's very simple to use and also their customer service is great. I highly recommend this software. Comments: I own online website for selling t-shirts. We sell internationally and we really needed a good software like PayTraq that would largely help us with order and sales management and multi currency billing & invoicing. It does the job perfectly so far. It is easy to use, is cloud based and offers wide variety of additional features that are useful to me and my employees. The fact that you can add unlimited products to the inventory system is another great thing we love about PayTraq. It truly enables great management and handles the accounting, purchasing, inventory and sales. Highly functional, affordable and extremely useful software that I truly recommend to any online businesses and companies. I run a Small New Media start up where I have to keep track of billing, invoices and many unique orders since we seldom provide services at a fixed rate. I¿ve never been a fan of cloud-based software because I¿ve always felt as if they lacked security and stability. However, PayTraq¿s versatility has loosened the load for my colleagues and I. I can access the software from anywhere and am therefore not bound to the office. It is an integrated Business Management suite that allows us to manage our data with reports on all of our day-to-day processes. The software was very user-friendly and was easy for everyone to pick up and input data as needed. Since switching to PayTraq, we¿ve saved a significant amount of time and it has allowed us to increase productivity since we¿ve been able to divide the management processes amongst ourselves. Our customer service return has increased as a result of the billing and invoice management service. I¿m very happy with it, highly recommended. Comments: As my company is a new startup, we have to remain lean and hiring is something we have to avoid unless it is for the purpose of a core business function. Hence for support functions such as time tracking, billings, invoicing, etc, we have been assessing a few software options. PayTraq is our eventual choice and we have been using it since the start of the year. The interface is user friendly and intuitive. I spent less than half a day getting used to most of it's important function relevant for my business. And the wonderful thing is it is cloud based, meaning I can access to the same database whether I am at home or office. If you are looking for a simple to use system with sufficient functions, I will recommend PayTraq. Comments: I run an online video game store and we have recently started selling internationally and accepting trade-ins. Due to this we wanted better accounting and Inventory management systems. After looking around a few forums, Pay Traq was recommended and as it offered exactly what we needed and more we decided to go ahead and use it. The system is excellent and very easy to use. As we are shipping and accepting trade-ins internationally we deal in multiple currencies and the Pay Traq system can work with all of them. Due to accepting trade-ins inventory management is a little more difficult due to unpredictable nature, the system allows for unlimited products to be entered and we can set up new products quickly and efficiently. This is especially important for us as we are sometimes offered retro systems and games that we do not already have in out catalogue the ability to add them easily in this case makes the process much smoother. The software easily handles all of our accounting, purchasing and sales along with inventory management. The ability to use the same software for stock levels and purchasing makes automating the process much simpler. Overall Pay Traq is an excellent all in one solution that I can access from anywhere which is great as I work from home quite often. The customer support has been world class every time I have called them. A highly recommended system for any business owner looking for an all in one solution for account, inventory management, sales and purchasing at a very reasonable price.